These are the making and repairing projects that are complete. Click on the title or picture to read more. 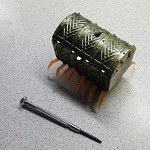 Inspired by Terry Pratchett's The Luggage, the Babbage's Baggage is a remote controlled treasure chest with legs. 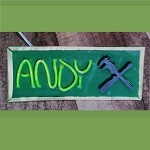 For the MakerCentral exhibition I made myself a name badge that showcased some of the skills I know. The base was wood which was framed with brass. 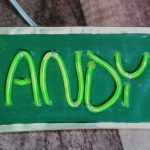 The detail was my name in EL wire and a 3D printed logo. A circular bezel to mount around a shower fitting. An early lathe project where I upcycled an old piece of computer case into a stylish cover for a friends bathroom. A Christmas decoration in the shape of a tree with flashing and multicoloured LEDs driven from an Adafruit Trinket board. 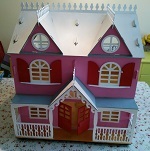 A kit dolls house that was painted and fitted with some stronger parts. 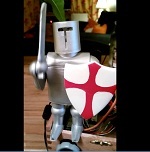 An electronics project to build a device that detects dragons and alerts the knights to spring into action. The project was entered in the Qualcomm Maker Month Contest 2016 and was featured on their Developer of the Month blog. The detector is activated by a passive infrared detector which activates the webcam to take a picture. The webcam image is passed to a computer vision library called OpenCV which determines if a Dragon has been detected. The defences in the form of lights and motion are activated and the operator is notified using the IFTTT maker API. The brain of the device is the DragonBoard410C running a Linux operating system, the control code is written in Python with libraries for the GPIO access. The mechanical aspects and enhancements are detailed here. 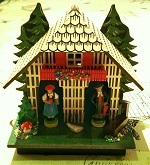 The Enchanted Cottage was built for the Element14 Enchanted Objects Design Challenge. A weather house was stripped down and fitted microcontroller, WiFi, 3D printed mechanism, fibre optics and an RGB LED. 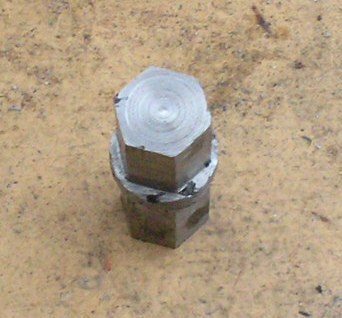 A metal pin to support the catch on a metal gate. The old pin had rusted away and needed replacing. A giant-sized LED and Resistor that actually works. A magnifier lamp to help with SMD work, made with scrap materials and 3D printed parts. I've tried to use as much as possible from my "scrap box". 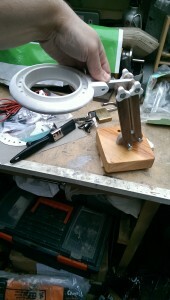 The aluminium components are things I cast from old hard disks back in 2008. The base was found dumped outside a furniture shop by Euston, I squared it up with a saw and surform before drilling, sanding and varnishing. 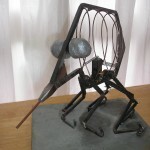 The arms were from an old garden parasol that had got worn out by the weather. I believe they are teak. They were planed and sanded to size before drilling. These will likely be left in a natural finish. 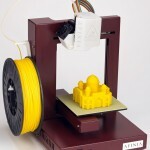 The 3D parts are designed using OpenSCAD and printed with a Cel Robox printer. Each year for the PSTOIC dinner we have a "Something" competition where people can bring along an item or items that fit the theme. These are then judged and the winner is awarded a medal that I've been making since 2015. 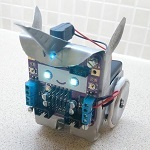 A stainless steel unicorn robot based on a cardboard template from Ross Atkin of The Crafty Robot and controlled using his new SmartiBot controller and software. 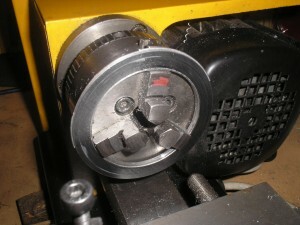 T shaped nuts for securing parts to a slotted table. 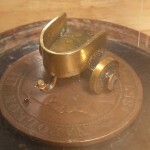 These were milled on the lathe and are used on the drill table. A mantel clock with the numbers in Topsy Turvy locations. This project is a mixture of mechanics, electronics and embedded firmware. It won a prize in the Maplin Arduino competition.